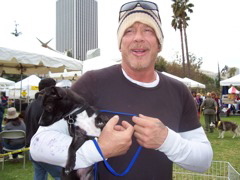 Mickey Rourke, long-time Chihuahua Rescue friend and supporter, has always been an ardent advocate for Chihuahuas, rescue dogs and small dogs. 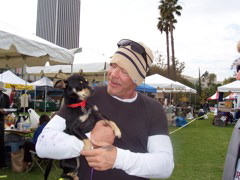 Mickey has enjoyed many successes in his career in Hollywood as well as some notoriety, but his love for the most defenseless and vulnerable of all ofthe pets, the littlest canines, is unshakeable and bespeaks of his compassionate and loving heart. 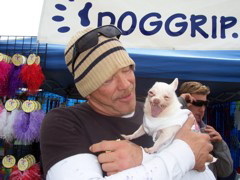 Actor, boxer, tough-guy and small-dog-lover Mickey Rourke, stops by at the Chihuahua Rescue booth at the recent adoption Expo. 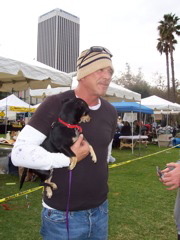 Thanks, Mickey! 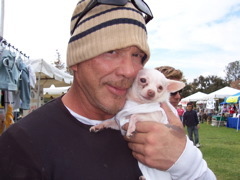 Mickey Rourke cradles adorable Chihuahua Rescue ambassador, Stuart Little.